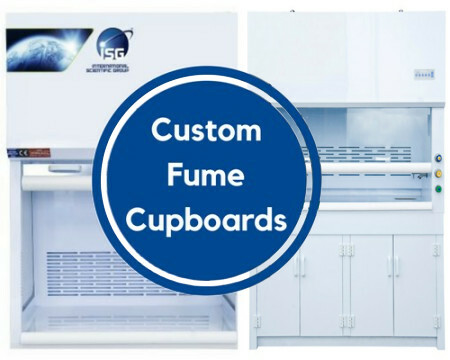 Here at Edulab, we pride ourselves on being a leading UK manufacturer of high-quality custom fume cupboards for educational and commercial laboratories. Stand options, and anything else we may not have mentioned! A laboratory fume hood provides localised ventilation and protection against toxic fumes, vapours and dust. It also protects against chemical spills and fires by acting as a physical barrier. For these reasons, selecting a high-quality fume cupboard is essential for minimising risk of injury. Before selecting the components for your custom fume cupboard design, you’ll need to know exactly how the unit will be used. As part of this, we recommend you get a chemical assessment done. This is a list of all chemicals, solvents and acids which could come into contact with the fume cupboard during its use. As fume cupboards are generally large units (fume hoods being a smaller option) making the most of the space you do have is important. While some providers may try to sell you more/bigger units than you may need, this leads to reduced energy efficiency/unnecessary maintenance costs. Another key aspect of safety (and durability) is the construction material. We use Virgin medical grade welded Polypropylene which offers much higher chemical resistance than materials used by competing products (such as mild steel with a thin coating) and generally see a higher energy/cost efficiency. While standard air foil bypass hoods are one the cheaper blowers on the market, it may not be suited for all uses, so be sure that you’re clear on exactly what your fume cupboard is going to be used for before beginning a custom build. We don't charge any additional premiums on top of your requirements and will always find a solution for every project.